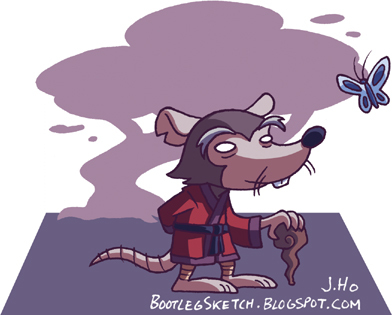 The aim here was to make Splinter appear as serene as possible, reflecting his wise, zen-like approach to life. The tree in the background is supposed to be bonsai-like. Or maybe it is a bonsai tree, grown huge as a result of exposure to radioactive mutagen? at first i thought the background was a mushroom cloud our gas emission haha! i actually really like the background.